People measure years in different ways. Most Americans’ year begins on Jan. 1 and ends Dec. 31. This is known as a calendar year, abbreviated as CY. Others, like the military and legislatures, order time from Oct. 1 to Sept. 30. The federal government calls this its fiscal year, or FY. In China, the first day of the new year falls on the new moon between Jan. 21 and Feb. 20. In 2017, the first day of the Chinese New Year was Jan. 28. If your surname is Blando, Golem, Dumke, or countless others who hunt deer with a bow and arrow, you probably operate on what I call a “bowhunting year” or BY. Now, it’s tough to decide when the BY actually begins, but since I don’t think anyone has determined that yet, I say it starts on OPENING DAY. I capitalized those two words not to shout at you but because of the truly magical significance of this day, at least to those in the aforementioned households. Now I understand that “opening day” means different things to different people. To some it means the first Milwaukee Brewers home game — which is also really important. To others it means opening day of fishing on the first Saturday in May, and for others it might mean opening day of the deer gun season — although we generally refer to that as the “gun opener.” I assume you are reading this on or around the bow opener, and for bowhunters, opening day always means the first day of archery season, which is normally on the second or third Saturday of September. This year, the BY begins on Saturday, Sept. 16, 2017 and it ends Sept. 14, 2018. In the Blando deer camp, the night before opening day marks the end of the previous bowhunting year but also serves as a celebratory day to ring in the new BY. It is a celebration of all the hard work preparing for opening day. It’s a celebration of the thousands of arrows sent downrange to ensure, if the opportunity presents itself, a clean kill of an unsuspecting buck or doe. It’s a celebration of the countless hours spent maintaining existing roads, trails and food plots and clearing new ones. It’s a celebration of large chunks of well-spent time scouting, maintaining and moving stands, and setting up new ones. Finally, it’s the celebration of the new relationships made and the old relationships strengthened with family and friends throughout the BY. In our camp, there is a palpable excitement as we awake on opening morning, far earlier than we need to, to get ready for that first morning hunt. No one hits the snooze button that day, and almost everyone wakes up before the alarm is anywhere near sounding off. Based on wind direction, we’ve all decided the night before where we are going to hunt, and each of us lies awake most of the night, thinking through different scenarios of that trophy buck sneaking past our stands or meandering within range through one of our food plots. 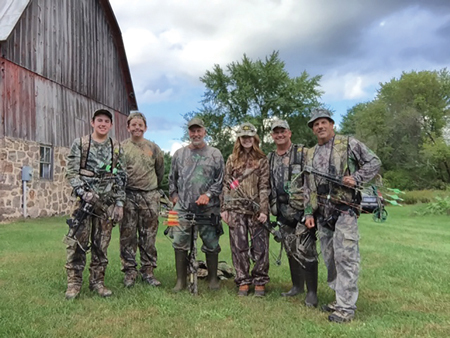 We dress in our scent-free clothing, put on our safety harnesses and grab our well-tuned bows with brand new arrows and razor-sharp broadheads. Then we huddle up for a quick picture and wish each other well as three generations of Blandos head out to our favorite stands to begin another BY. As we walk to our stands, well before dawn, we listen to the sounds of the nocturnal animals, birds and insects, and we take in the smells of the early falling cottonwood and poplar leaves beginning to decompose. We sniff the white pines and the effervescent smell of black walnuts that have recently fallen to earth to begin their decomposition and regeneration process. We are bowhunters, and at this point we feel omnipotent. We experience a feeling of peace and a sense that everything in our world is perfectly aligned. At this moment, we have no doubt whatsoever that God is with us. We climb into our stands and connect our safety harnesses to the pre-installed strap. We disconnect our quivers and hang them on the equipment hooks. Then we nock our favorite arrow (I actually name mine) and hang our bows on the bow hooks also previously installed. Then, we each sit down and send a text to all others in the hunting party to indicate that we are set. Finally, we await the moments at dawn when the woods transition from the nocturnal to the diurnal. This is a magical time to reflect on how blessed we truly are to have received the gift of the outdoors. In our family, it is a chance to reflect on this perpetual gift that our father, Sam Blando, gave to us when we were very young and continues to share with us each bowhunting year. When the morning hunt ends, we gather back at camp to swap stories of the adventures and experiences of each hunter. We then cook bacon and eggs on the Coleman stove and then, after cleanup, settle in for a short outdoor nap before the start of the Wisconsin Badgers football game. After a Badgers win, we slip back into our camouflage, grab our gear, take another picture to memorialize opening day, and then head out for the evening hunt. This cycle repeats itself again and again most weekends until the first Sunday of January, when the hunting portion of a bowhunting year ends. Even though we’ve just endured some pretty tough conditions during the late season, it’s always a sad day when the sun goes down on that final hunting day. We know that it is not yet over as we still have over eight months left in the BY. In January, February and March, we will spend our time on a multitude of tasks — cleaning, organizing and storing our gear, maintaining the stands, cutting brush, and fixing our small bridges over the creeks in the now frozen marshes. In April and May, usually while turkey hunting, we will spend many hours scouting deer while looking for shed antlers and analyzing our trail cams to see which deer made it through the winter and the previous fall’s hunting seasons. Summer comes, and the excitement and anticipation begins to build as we know we are just a few months from the beginning of yet another bowhunting year. After a summer of clearing brush, disking, tilling, planting and fertilizing existing and new food plots, we are now just a few short weeks from opening day. And then, just like Christmas morning, OPENING DAY arrives, as it does every year. And just like Christmas, it arrives bearing physical, emotional and spiritual gifts. We will once again feel omnipotent, with a total sense of peace because everything is right with the world. Like at Christmas, we will once again feel and see the presence of our God in all that He created in the great outdoors. At Badger Sportsman, we wish you a safe and bountiful opening day and a magical and peaceful bowhunting year.